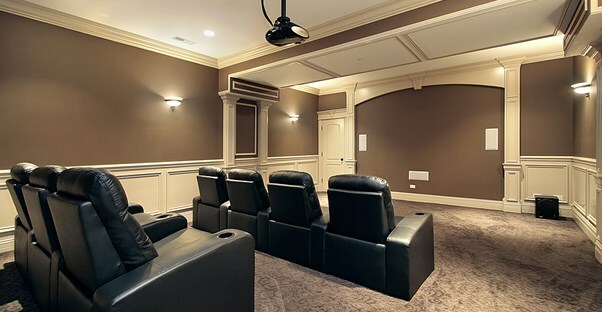 If you have a basement, then you’ve got the ideal spot for a home theater. It’s cool, naturally dark, and already slightly soundproofed. This makes it one of the perfect spots for adding in your sweet surround sound system and awesome big screen. You want to do the work right to be sure that you create an asset that you can enjoy for years to come. Here are some tips to help you convert that boring basement into an amazing home theater. At the end of the day, a basement is a subterranean space that may flood. Even if your home has stayed dry for more than 30 years, a powerful storm could overwhelm drains and force water into your home. Any water issues must be addressed before you start finishing the space. Even if your basement is beautifully dry, limit future losses by putting all electronics, power lines and electrical outlets up closer to the ceiling. Remember to talk to your insurance company about the right coverage for your basement home theater. Even though this is a subterranean space, you may be able to get a sump pump and storm sewer rider for some protection in case the storm drains back up into your house. You also may be able to get special protection for your electronics even though they’re in the basement. This space may have your laundry room, and your furnace and hot water heater are almost certainly down there too. Spend some time in the basement and listen to the background noise that’s created by your appliances. You may decide it’s worth the effort to enclose these fixtures and ensure you won’t have any distractions during the best parts of your favorite movies. When enclosing these areas, be sure to allow ample room to move around the fixtures for future repairs or replacements. You want the basement to be comfortable, and that means investing in plenty of insulation. Rather than the typical four-inch walls, make them a little thicker to install more insulation and allow for all of your wires. The ceiling must be well insulated to keep the sound out of the rooms above. Brining in a soundproofing specialist will cost more money, but it’s well worth the investment if you want to make sure the rooms above will stay quiet. Go with home automation to make this entire room more enjoyable. It’s not always enough to have the right lighting and a great sound system. If you can afford it, automate you home theater so you can control these features from the comfort of your recliner. It’s important to make a home theater dark, but you should also have some lighting for people to see by. Low voltage lighting set along the baseboards is a great option because it allows for people to safely navigate the room without creating a glare on the screen. You’ll love having the private space for watching movies, and you can create the ideal acoustics and sound. It’s an investment in your home that you’re sure to enjoy for many years to come.